Glidden Pottery is a unique stoneware bodied dinnerware and artware that was produced in Alfred, New York from 1940 to 1957. Production was enormous with 6,000 pieces manufactured each week in 1953. With millions of pieces of this durable pottery still in existence, collectors today vie for unique pieces at auction on Ebay. Collectors boast of having 500 or 600 pieces or even as many as 2,700 examples of Gliddenware in their private collections. It is legendary that Lucille Ball and Desi Arnaz owned a set of Gliddenware and examples can be spotted if one carefully watches early episodes of the I Love Lucy show. Glidden Pottery was the American equivalent of the Chinese Song Dynasty (960-1279) people's ware known as Cizhou ware. The Chinese people's ware was a stoneware product made for the upwardly mobile merchant class. Its designs were comprised primarily of simple bowls, dishes, vases, cups, and bottles, all thrown and glazed; either in monochrome ivory or with hand-painted or incised decorations. Cizhou wares were some of the earliest signed Chinese ceramics. Glidden Pottery, produced in the United States nearly a millennium later, utilized modern production methods of slipcasting or ram pressing, but each of the more than 200 shapes were individually glazed and decorated. And most pieces were intentionally marked with a Glidden Pottery signature or backstamp which varied over the years. With 16-piece undecorated starter sets selling for $14.50, Gliddenware was affordable for many. We don't know the names of the best designers of Song Dynasty Cizhou ware, but we do know the names of several of the key designers of Glidden Pottery. Notable designers include the founder, Glidden Parker, who himself was a student at the New York State College of Ceramics in Alfred. He attended summer school from 1937-39 where he was a student under the designer Don Schreckengost. While many attribute the success of Glidden Pottery to the genius of Glidden Parker alone, the true genius lay in his ability to select colleagues to work with who served as designers, mold makers, and decorators. Sergio Dello Strologo and Fong Chow both collaborated with Glidden Parker and numerous awards and prizes were awarded to their designs. Glidden Pottery, the exhibition, and the accompanying catalogue will present a detailed history of Gliddenware and its founder Glidden Parker. Common and uncommon Glidden Pottery will be selected for exhibition -- and illustration in the exhibition catalogue. The catalogue will illustrate popular patterns and their common names as well as include line drawings of a large selection of selected shapes of both the dinnerware and the artware lines. While the exhibition will be on view April 12 - September 27, 2001, the opening reception will be held from 2-4 p.m. on Saturday April 28th. Glidden designer Fong Chow will be present at the opening. Other collectors events will be announced at a later date. The exhibition is funded, in part, by generous contributions from The Gallery and Crandall's Jewelry in Alfred and the David Ammering Memorial Fund. 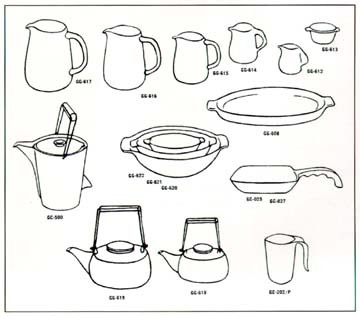 Line drawings from advertising catalogue for Glidden Stoneware, Courtesy Hinkle Library.